In this series of articles I will find out how to make a particular handgonne, and in extension, very early firearms in general; or rather how they could have been manufactured with the contemporary technology. I am not much for guns’n shooting, but I have always been intrigued by the casting process of guns and cannon. Why? Because, as a fully trained bronze founder I know that there are a lot of challenges involved and even a lot of room for failure. As a professional maker of things, failures are among the least favourite topics to talk about. However, also being a scientist helps to overcome this predicament: Without failure there can be no progress. Or in other words we should not content ourselves with our hypotheses, but should constantly try to falsify them. 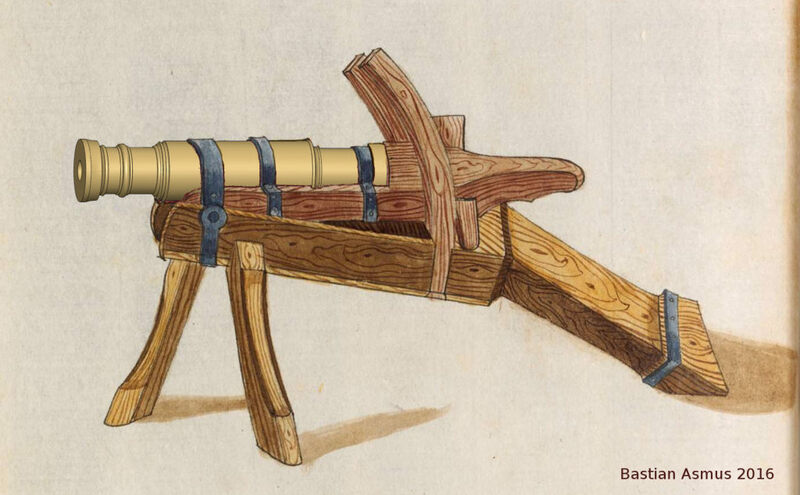 This image of a supposedly 15th century handgonne shows a very early breech loading system, that did not take hold for centuries to come. Technical limitations in the manufacturing process, may well be responsible for this. It could simply not be manufactured as easily as the much more common muzzle loaders. Source: Viking Swords Forum thread 7364. The handgonne is published in the London Park Lane Arms Fair catalogue . Pictures of the same handgonne are also published by Michael Trömmer on the Vikingswords forum. In this thread another user, Alexander Spiridonov, draws our attention to a treatise, the Zibaldone, by Buonaccorso Ghiberti, grandson of the famous Florentine artist Lorenzo Ghiberti. Here, the handgonne is sketched almost exactly as the piece shown in the forums post. Image taken from the Buonaccorso Ghiberti, Zibladone, f 83v. It shows the exact same handgonne design as the piece above. Is the sketch in the Zibaldone a construction sketch, i.e. an original design by Ghiberti, or is it possibly something he saw and jotted down so as not to forget it? We know that the habit of proper citation was not yet established and many authors copied from wherever they could lay there eyes upon. The same article by Rietsche points out other more or less contemporary designs in the Kriegsbuch by Eyb , now housed in Erlangen-Nürnberg University library. There are three more types of breech loaded handgonnes in there. The top most one, is the one discussed by the author. It seems as if there is no breech block to hold the cartridge in place and secure it against recoil. Instead “…a rectangular slide, which moves through a rectangular slot in the socket.” . 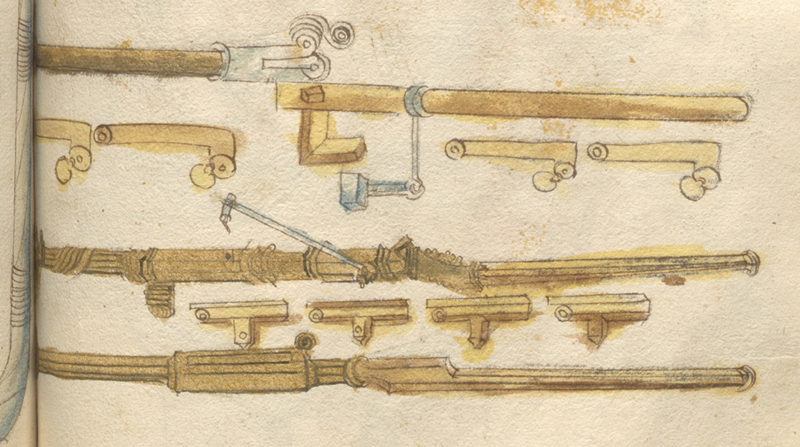 In the Kriegsbuch by Ludwig von Eyb (1500) there are other breech loaded designs. Source: Universitätsbibliothek Erlangen-Nürnberg. It is unclear how the design of the apparently in steel or iron made receptacle for the cartridge may have looked like. Further it is unclear what the steel or iron attachment at the tiller or socket was used for. Currently it is not clear where one material ends and where another begins, as the colour for bronze and wood is very similar. 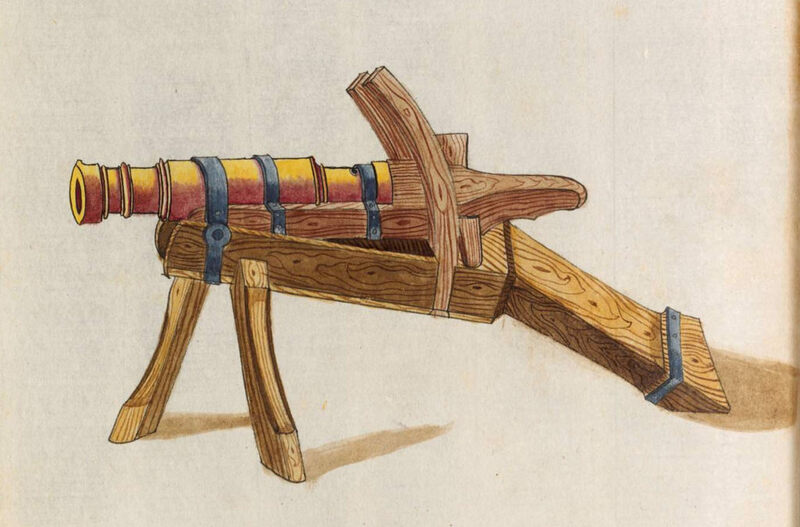 Image of a breech loaded handgonne in the Weimarer Ingenieurs- und Wunderbuch form 1520. Clearly a copy of the handgonne design made in the Kriegsbuch by Eyb. Source: Herzogin Amalia Bibliothek Weimarer Ingenieurkunst- und Wunderbuch. the design was too dangerous, the cartridge issuing from the wrong end of the barrel – hey isn’t that one definition of back-firing? What ever the reason may be, all that these above mentioned ones have in common, is that the design ideas probably evolved faster than the technological development. Currently this is – I am aware of it – pure speculation. A year ago a I begin to recreate the technology to make a 200kg mid to late 15th century cannon. The efforts were documented by the German film team of Peter Prestel and a short synthesis of this project found its way into this documentary (German only) on the German Peasants’ Wars. I have been bronze casting for the last 25 years; there is something about the reconstruction and practical application of ancient technology that evades our modern day workshop experience. It certainly did, where the cannon was concerned. For me the project provided crucial insights. In the end the cannon was not fit for shooting. However this experiment allowed me to test several hypotheses with regards to the moulding and casting technology. Sadly there are no records on the making of such early cannon. There are a lot of late medieval images on the bronze cannon, however only a few on this particular type I reconstructed. It can be found in the Zeugbuch of Maximilian 173 v. . For your convenience here it is. The original painting in Maximilian I. Zeugbuch. Source: urn:nbn:de:bvb:12-bsb00020956-6. Bayerische Staatsbibliothek. Folio 173 v. This represents a cannon of the mid 15th century, its shape reminiscent of the preceding and still contemporary ring rod iron cannon. It is impossible to decide if this represents a gun for lead or stone balls. I decided to reconstruct this as a gun for lead balls with a calibre of 60 mm. The original painting with the reconstruction edited in place. In this 3D reconstruction I have not yet attached the bead to the cannon, although present in the original. A fact due to the regrettable negligence by the author. This project touches on several key interests of mine. What are the process steps involved in making of the handgonne? I am very curious about the performance of these guns, more specifically in the effects the shooting has on the material and mechanical properties of the handgonne. There is so little known about early bronze fire arms. I am willing to put in the effort to contribute towards filling in these gaps. I am all for the challenge to make such a thing, not least of all to solve the problem of casting a piece with a long and narrow core. Also, at the end of the process, I am sure, there will be a batch of these handgonnes available, though if they meet modern safety regulation and will be safe to use or only scientific test and show pieces I cannot say at this stage. How well does this handgonne perform? How well can cast bronze withstand the strain of black powder usage? How safe is it to use such a firearm? How long can it be used? How was it made exactly – we know they were cast, but it does stop there? How was the barrel manufactured exactly? Cast with core, drilled, reamed, bored? Which casting method is the most likely to succeed? …and numerous small details, that you can only ask if you are versed in application of the artes mechanicae… I really do want to know HOW they were made back in the day and will certainly put in all the faculties that are available to me, to arrive at a hypothesis that I will put to the test. I am documenting the whole build process in a series of short films which I will make available on my youtube channel. On my FB page I will post smaller updates. This entry was posted on Saturday, January 20th, 2018 at 11:07and is filed under . You can follow any responses to this entry through the RSS 2.0 feed. You can leave a response, or trackback from your own site.